On Sunday, Lauren and I were meeting up with some of our friends for brunch. We were looking for something around Washington, DC’s Georgetown. I stumbled upon the Glover Park gastropub Mayfair & Pine. 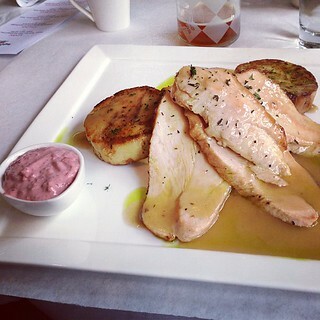 When I saw the reasonably-priced English-inspired gastropub menu, I knew it was a place to try and our friends agreed. When we got there, it was around 11am on Sunday. I was totally shocked how slow it was. There were only a handful of other people, which is funny because I’d made a reservation. Apparently, it’s not just a hot time for the bar, which surprised me because beers were half priced. 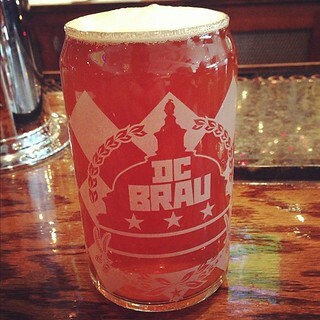 $3 for a pint of DC Brau’s Public Ale… sweet! According to the bartender, their goal wasn’t to be a destination bar but to be a neighborhood bar and things are just slow during that time. Mayfair & Pine shows English Premier League football (soccer) games on Saturday & Sunday mornings. When we were there, we got to see the start of the Manchester v Chelsea game, which was fun to watch. I feel like I’d watch a lot more soccer if there was a cool bar to watch it at. Too bad, Glover Park is so far away. The gastropub is owned & operated by Top Chef season 2 contestant Emily Sprissler and her husband Jason Cote. Emily is Executive Chef and Jason is Chef De Cuisine It was fun to chat with Emily briefly after brunch. I think of Mayfair & Pine in a lot of the same way that I do Tunnicliff’s Tavern in Eastern Market. They’re more than just restaurant. There a place where the neighborhoods come together to live life together. It was evident that this was something you could do at Mayfair & Pine. Plus, the food & drinks are delicious. This is the kind of placed I’d go to often.